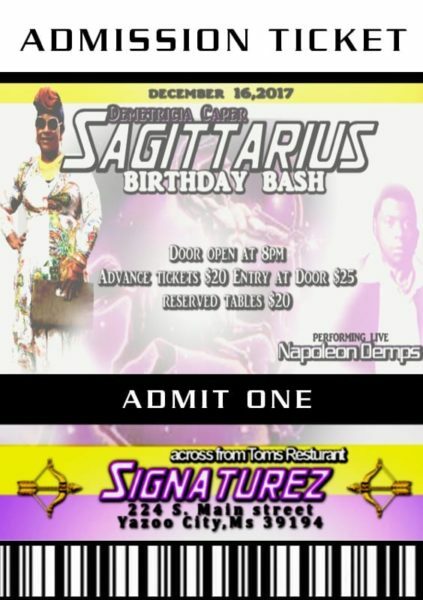 Signaturez Restaurant hosts a Birthday Bash to celebrate December birthdays, Saturday, December 16 starting at 8 pm. Advance tickets are $20 each. Admission will be $25 at the door. A limited number of Reserved Tables are available for $20 and will include bar set up and an appetizer. Napoleon Demps will perform live! For more information and to purchase tickets, contact Signaturez Restaurant at 662-763-5433. Signaturez is located at 224 South Main Street in Yazoo City. Follow Signaturez on Facebook for updates.